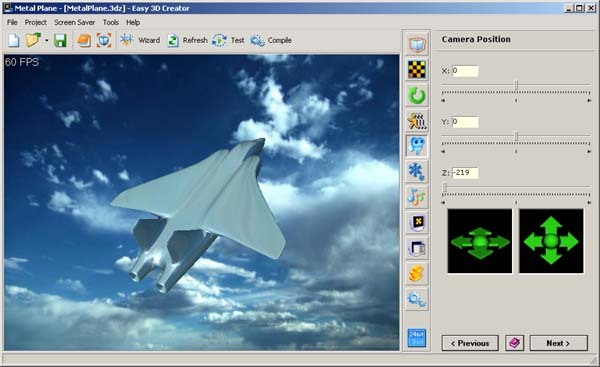 ﻿ Easy 3D Creator By DzSoft - Create stunning 3D screen savers with a few mouse clicks! With Easy 3D Creator you can create stunning 3D screen savers in a few minutes with no programming. All you need is to set some parameters that determine your screen saver's appearance and behavior in step-by-step mode seeing the result immediately. What does Easy 3D Creator do? Create stunning 3D screensavers in a few minutes with no programming! Wrap the screen saver into installer and generate End-User License Agreement for you automatically! You can use a built-in wizard to create a screen saver with your logo or photos with a few mouse clicks! Can generate time-limited shareware screen savers! What can I do with Easy 3D Creator? Dramatically increase your site's traffic by publishing free 3D screen savers! Amaze your friends with your own artistic 3D screen savers (you can use your photos as textures)! Put your company's logo in a screen saver and distribute it - that will be a very valuable advertising for your company (your boss will be very pleased J)! Enjoy creating animated 3D art! Get unlimited number of different screen savers for your desktop!